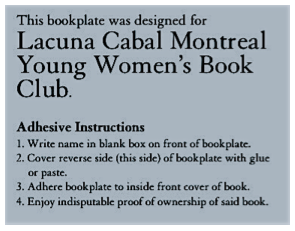 This is the official bookplate for the Lacuna Cabal Montreal Young Women's Book Club. It was designed by Evan Munday, based on my own tinkerings with a 1930s bookplate made for Alpha Delta Phi at Cornell University. 'Manus Multae Cor Unum' means 'Many Hands One Heart'. I don't live in Montreal anymore. I was there as a student, and I still miss the city and visit it as often as possible. I'm not sure I really understand the term psychogeography, but I believe I hold the geography of Montreal in my psyche. I wrote The Last Days of the Lacuna Cabal so I could turn over and examine all the detritus of my memories of the city. Like many students I was cash poor, and one of the few things I could do for entertainment was walk through the streets and look at the people and their fashions and the architecture and the statuary. The parks and the churches. The mountain. The city is full of icons. St. Joseph's Oratory. Farine Five Roses. The old city by the river. This city is possessed by both a mountain and a river. In fact, it's an island on the St. Lawrence River. Island, mountain, river. Is there any other city in the world like that? Some of these icons are literal. Montreal is populated by winged statues. 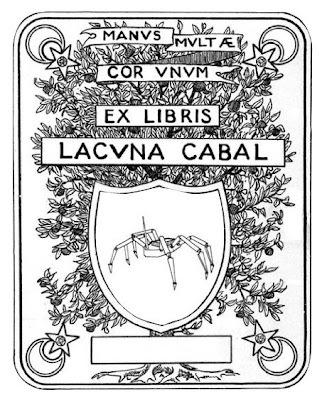 One of them was swiftly sketched by Evan from a photograph for this bookplate. -but rather this one, which stands on a high pillar at the foot of the Montreal Mountain, near where the tam-tams have their jams on weekends. You may ask, what do Montreal angels have to do with The Epic of Gilgamesh? As a starting point for this novel, I wanted to devise a pantheon for the world of the book. I needed a way to believe that the gods of ancient Mesopotamia could be present and walking the streets in Montreal, the way a Sumerian might imagine them. I took inspiration from these stone angels that peek up into or gaze down over the urban landscape of the city. They represent the closest thing to a quotidian version of such gods. So I decided to imagine the girls of the Lacuna Cabal as a group of minor deities in a world that would give them a certain amount of control over one another (depending on who was in charge in a given instant) and complete control over the men in their midst. I also felt, given the boys' overall powerlessness, it was only fair for them to exert a modicum of control as well. So Coby, one of the unfortunate male characters, got to build a hexapod for the Haptics Lab at the Centre for Intelligent Machines at McGill University, which was designed to scuttle away from the light and into the shadows. 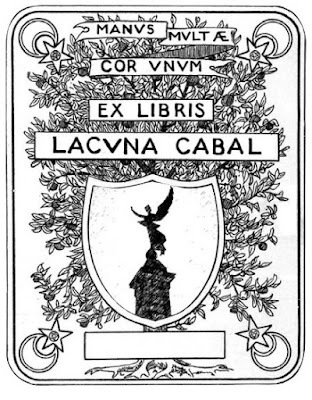 Coby gets a bookplate as well, as does everyone who joins the (now defunct) Lacuna Cabal, even if, as is the case with boys, they're only half-members. Unfortunately, over the course of the novel, Coby loses control of his hexapod.